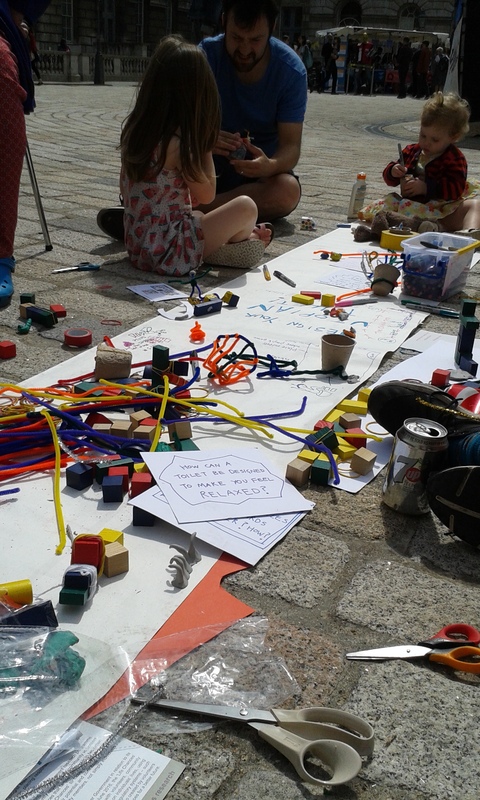 The three-day Utopia Fair event at Somerset House began on 24th June – the morning Britain found itself plunged into Brexit, an irony in terms of timing which was lost on no one. The Fair was part of the UTOPIA 2016: A Year of Imagination and Possibility activities, celebrating the 500th anniversary of the publication of Thomas More’s radical imagining of a better world. The grand, cloistered courtyard of Somerset House was to provide a pop-up version of More’s imagining of a ‘no place’ that is also a ‘good place’ – at once located centrally just off London’s West End, and yet strangely set apart from the rest of the city. The carnivalesque juxtaposition of worlds was a theme that continued throughout the event – from Brexit to utopia, academics mingling with tourists, to the country fair style of the stalls set within the walls of a Tudor palace, this was to be a weekend of playful and stimulating contrasts. The Fair presented a number of different stalls presenting outputs from various Connected Communities projects, all engaging with the creative and political possibilities of utopian imaginings. The event proposed future-oriented thinking as a gesture of hope and political agency. 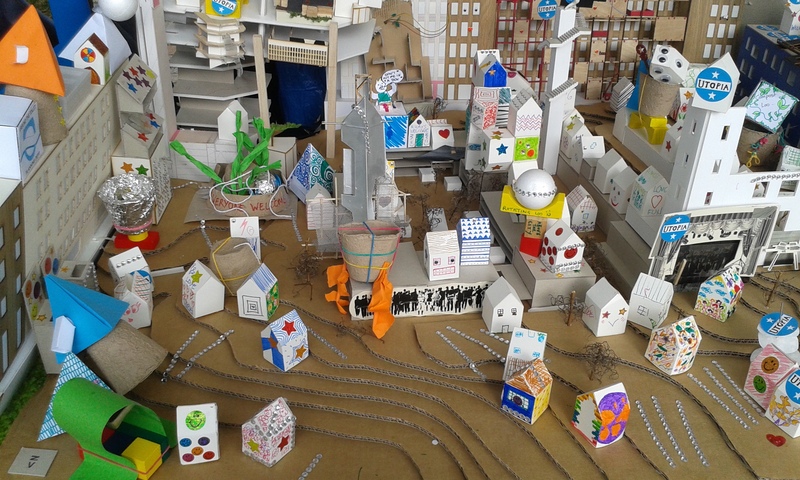 As one person noted at a speaker event on Utopian Housing which took place in one of the wings at Somerset House, communities are often asked to reflect on the ‘history’ of a place, group or institution. But often, when the conversation turns to plans for the ‘future’, then experts – architects, designers, councillors – will step in to declare what is possible or permissible (or affordable). In other words, there is often an unspoken privilege – or symbolic capital – in speaking about and for the future which is not always afforded to community groups. The Fair’s celebration of utopia seemed to suggest that everyone should have the opportunity to radically reimagine, shape or design the way the future. Utopian thought, in this way, has the potential to be a levelling act – one that is creative, ambitious and a powerful statement of a shared, collective will. Travelling Toilet Tales and Servicing Utopia both had connected stalls at the fair in which we provided ‘hands-on’ activities for members of the public as well as exhibits from our past activities. The public received the first viewing on iPads of our animated Toilet Tales film, an exploration into the ways in which everyday journeys are planned around the un/availability of a suitable toilet and featuring stories from a range of toilet users, including truckers, disabled parents, and non-binary people. Visitors also got the chance to listen to the individual toilet stories in full, browse our postcards designed by artist Smizz, and talk to the special guests who were helping on the stall. At various points over the weekend, we were lucky enough to be joined by members of Accessible Derbyshire, Changing Places,Action for Trans Health, Truckers’ Toilets UK, and the Loiterers Resistance Movement, as well as the storytellers and artists behind the films for both projects and the digital Toilet Toolkit. This weekend also presented the first opportunity for the public to use the interactive digital Toilet Toolkit and view the short animated film produced by the Servicing Utopia team. The toolkit is aimed at architects and other design professionals to promote the accessible design of toilet spaces, and allows users to virtually ‘walk around’ toilet spaces and interact with the items and facilities. This will be available to view on our blog very shortly (watch this space). Our interactive toilet installation, designed and built by MA Architecture students at the University of Sheffield, was constructed for visitors to view, prompting conversation and graffiti contributions. Written comments from our visitors ranged from a poll about toilet roll use, toilet confessions and jokes, to reflections on personal habits. People wrote on the back of artist Smizz’s postcards to include their own toilet tales, sharing stories that were informative, funny and sometimes disturbing: a dad being told off for changing a baby in a women’s toilet; one person’s account of the inadequacy and fallacy of ‘Community Toilets’ (businesses allowing the general public to use facilities); cleaners rebelling against unacceptable toilet mess; recollections of an instance of violent bullying in school toilets; library toilets providing ‘safe spaces’ for users to have private conversations; one person having to resort to using the ‘please wash your hands’ sign as emergency toilet paper; stories of global lavatory etiquette from the Gambia to the Himalayas to Tokyo; and important notification of a new venue in Liverpool that has a toilet DJ. All of these contributions turned into conversations over the course of the weekend as new visitors responded to the comments left by other people attending the Fair. 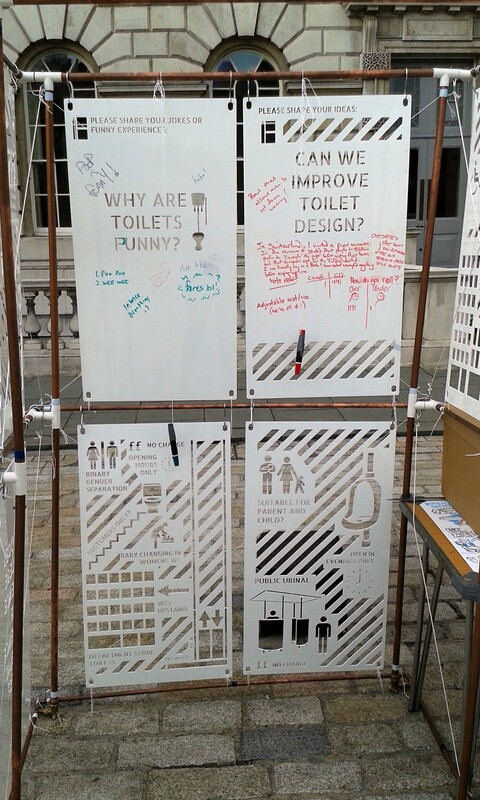 As toilet specialists, we were curious to see what kind of facilities would be provided in the historic grounds of Somerset House. There were plenty of options available, including gender neutral toilets near the main reception area which were the source of much discussion (and not just on our particular stall). These were impressive ‘state-of-the-art’ toilets that had given some consideration to providing gender neutral options for everyone, with gleaming surfaces, modern fittings and private washing facilities in each stall. But what was striking was how far the disabled toilets fell short in comparison. Dated, not quite as clean and certainly not intended to be any utopian ‘showcase’ for twenty-first century toilets, the small-ish cubicle also functioned as a boiler room and the only space for baby-changing. Like many accessible toilets, it could have been more accommodating and indulgent…and accessible. The Utopia Fair also gave us the opportunity to meet with other researchers working on Connected Communities projects and to reflect on the potential for new links and poi nts of connection. TheStories of Change project, which explores energy and community, transported their mobile photobooth across to our stall and asked us to contribute a vision of energy-efficient toilets. Ours included a wind-powered flush and use of recycled/‘dirty’ water. The open and informal setting meant that there were fluid interactions between the various stalls, and the opportunity to share experiences, tips and stories about our diverse projects. What was particularly effective about the Somerset House Fair was the combination of abstract thinking and imagining on the one hand, alongside a more tactile sense of getting stuck into hands-on activities, talking, designing and listening – from building utopian playgrounds, to model-making, to finding yourself immersed in a live puppetry performance. It was also wonderful to reunite various members of our Toilets team – and for us to also think creatively and ambitiously ahead to our own future projects.